This one-stop resource maps out the legal landscape for burgeoning field that is too often bogged down by bureaucracy and incomplete access to information about the laws governing it. Intellectual Property Technology Transfer, 2nd Edition is your one-stop source for comprehensive analysis of the central legal issues governing interactions between industry and research institutions. This valuable 578-page guide maps out the legal landscape in this burgeoning field and provides you with a rigorous analysis of the legal and practical constraints placed on technology transfer. With the valuable insight you’ll find in this guide, you’ll be armed with proven strategies and guidance that will lead to successful negotiations. Tech Transfer Central is proud to partner with Bloomberg BNA Books to bring our customers access to this comprehensive and authoritative resource. All Bloomberg BNA Books are written by respected experts with extensive experience in patent law and IP licensing. These renowned authors draw from their wealth of professional expertise and in-depth research to deliver the most highly regarded editorial quality in the industry. 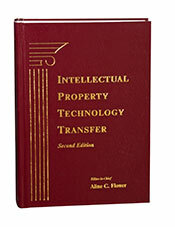 The editor-in-chief of Intellectual Property Technology Transfer, 2nd Edition is Aline C. Flower. Ms. Flower is Associate General Counsel at the Bill & Melinda Gates Foundation. Before joining the Foundation, Aline practiced employment and intellectual property law with Garvey, Schubert & Barer in Seattle and then served as Manager of Legal Affairs for Technology Licensing at the University of Washington. Aline has drafted and negotiated a wide range of IP and technology research, development, commercialization and related agreements.